Reminds me of the mal term Kattan chai - Black tea. Also reminds me of the time I worked as in intern at an NGO - used to get amazing tea to drink..in a dirty cup! Haha - I'm sorry I haven't been around! I keep getting too busy! How have you been though? 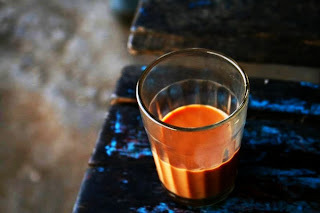 I like Chai - I used to live with a lady who went to India every year and knew how to make it perfectly! Cuckoo : Yes I did. We share the same emotion on this subject, eh? Alice : Well, doesn't it always? Blueguitar : Best of luck doc! Bendtherulz : LOL, maybe you threw the wrong kind of scissors at it! Tia : You should make me some "Kattan Chai" someday. [:-P]to (mis)quote Sameer from Dil Chahta Hai - "Hum chai peene ke liye kahiin bhi jaa sakte hain". Lidia : Its not too difficult to make yourself. Learn it up and you can set up your own little "chai" stall in OZ. I am sure it would be a big hit and you would then be called Billionaire Amy! BTW, you still haven't told me what "Tohou Lidia" is. Is it your name? I had to go to my older posts to get a link to over here land since i cannot access it directly through the recent links. Says I dont have access. Zii :I'm really sorry about that man but I've checked again and I've still got my blog on "visible to everybody" status. If you are facing the problem with a number of other blogs, maybe you could try writing to blogger? The Jedi :Yes I am. Hopefully will be back in India for good in June/July.